Презентация на тему: "Презентация на тему "Рождество в Великобритании"". Скачать бесплатно и без регистрации. 1 Выполнила учащаяся 10 Л класса Лисовец А. Проверила Чухнина Е.И. 3 Christmas Day, December 25,is probably the most popular holiday in Great Britain. It is a family holiday. Traditionally all relatives and friends give each other presents. So before Christmas all the department stores and shops are crowded, everybody is choosing a present. In general, people get prepared for this holiday very carefully. They decorate their houses in the traditional way, that is the Christmas trees are set up in houses, in the streets and churches. The Christmas trees are always decorated with fairy lights, angels and small toys. In addition litlle packets with nuts, candies and special biscuits are hung on the tree. Presents are put around the tree and artificial ''frost'' is scattered over the branches. Christmas Day, December 25,is probably the most popular holiday in Great Britain. It is a family holiday. Traditionally all relatives and friends give each other presents. So before Christmas all the department stores and shops are crowded, everybody is choosing a present. In general, people get prepared for this holiday very carefully. They decorate their houses in the traditional way, that is the Christmas trees are set up in houses, in the streets and churches. The Christmas trees are always decorated with fairy lights, angels and small toys. In addition litlle packets with nuts, candies and special biscuits are hung on the tree. Presents are put around the tree and artificial ''frost'' is scattered over the branches. 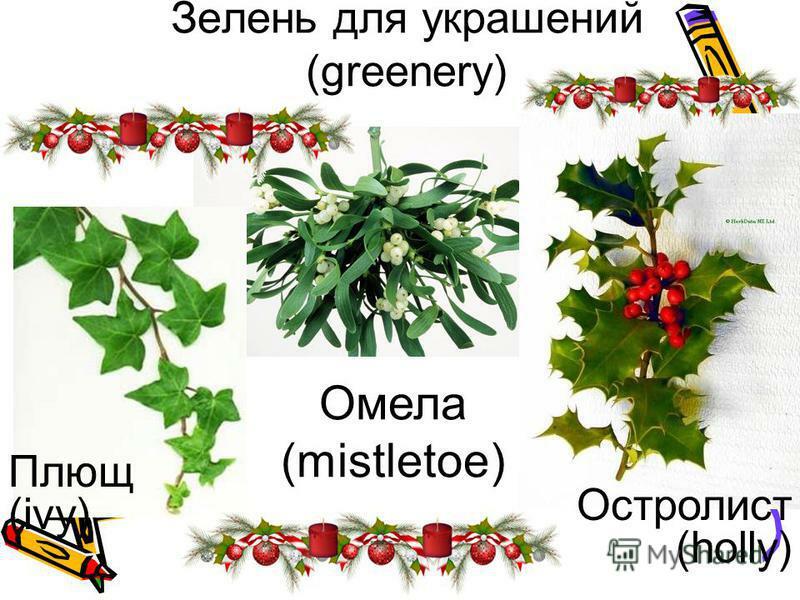 4 Besides the Christmas tree, holly and mistletoe are used to decorate the house. Christmas Day, December 25,is probably the most popular holiday in Great Britain. It is a family holiday. Traditionally all relatives and friends give. Made by Frolenko Aleksandr. Christmas Day, December 25,is probably the most popular holiday in Great Britain. It is a family holiday. Traditionally all. Made by Fetisov Kirill. 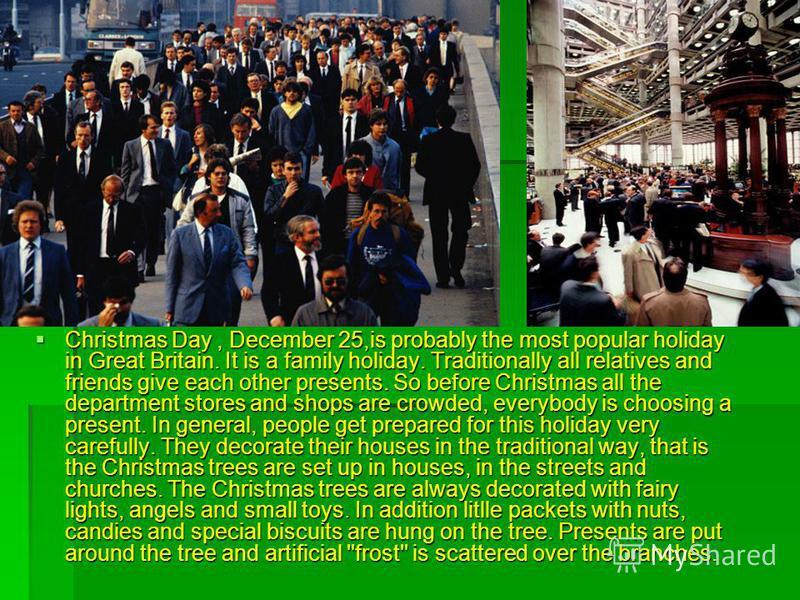 Christmas Day, December 25,is probably the most popular holiday in Great Britan. It is a family holiday. Traditionally all relatives. 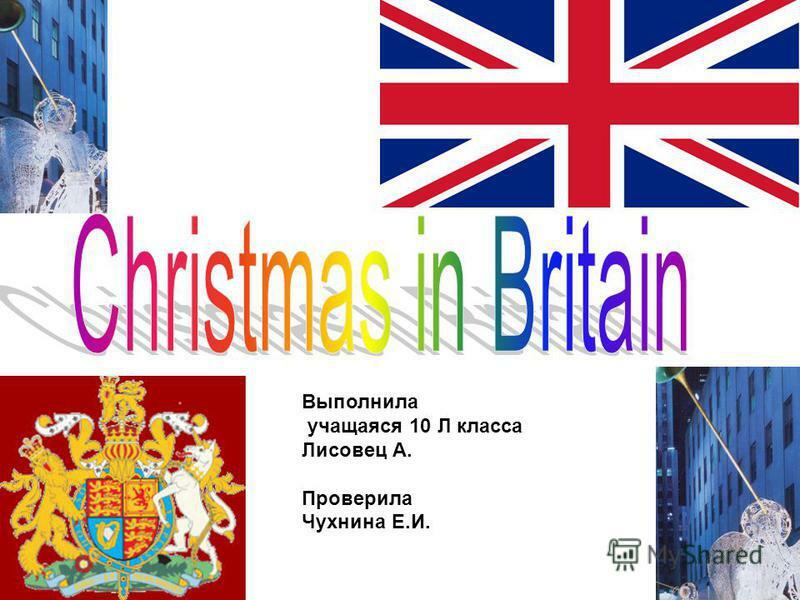 Christmas in Great Britain. Christmas Day, December 25, is probably the most popular holiday in Great Britain. It is a family holiday. Traditionally all. Презентация к уроку (английский язык, 7 класс) по теме: Презентация на тему "Christmas in Great Britain"
1.Christmas Day 2.Halloween 3.Queens Official birthday 4. Saint Valentines Day. Презентация к уроку по английскому языку на тему: Презентация на тему:Рождество в Великобритании.5класс. Christmas presents. 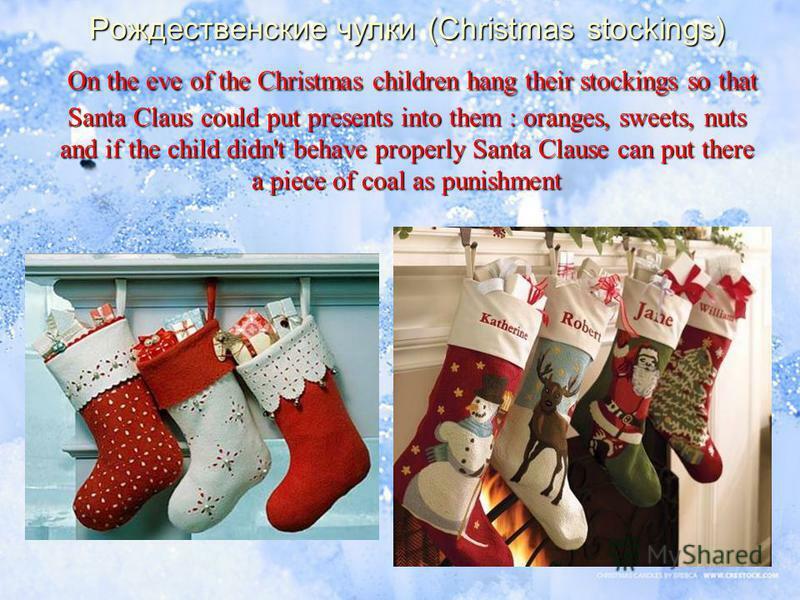 (Stocking) Чулок для подарков In Great Britain children believe, that Santa Claus put presents in the stockings. The 25th of December is Christmas Day. It's a happy holiday for many people in different countries. It is time to give and receive presents. Christmas in Great Britain Bundiyk Tanya Preparing To Christmas The British celebrate Christmas on December 25. They buy gifts for each other, decorate. Merry Christmas!. Christmas symbols wreath reindeer bell stocking fireplace Father Christmas candle gift. Christmas On the 25th of December there is the greatest holiday of all in England – Christmas. People send X-mas cards to their friends and relatives. Christmas is a very nice festival ! Children from all over the world like this holiday very much. Why? And what about you? Do you like Christmas and New. Christmas is Christian holiday that celebrates the birth of Jesus Christ. For millions of Christians throughout the world it is the happiest and the busiest. Holidays Cherepcova Regina 8 х-б класс. St.Valentine is day. Christmas in Great Britain. Santa Claus On the 25th of December English children celebrate Christmas. Christmas is their favourite holiday. Santa Claus. 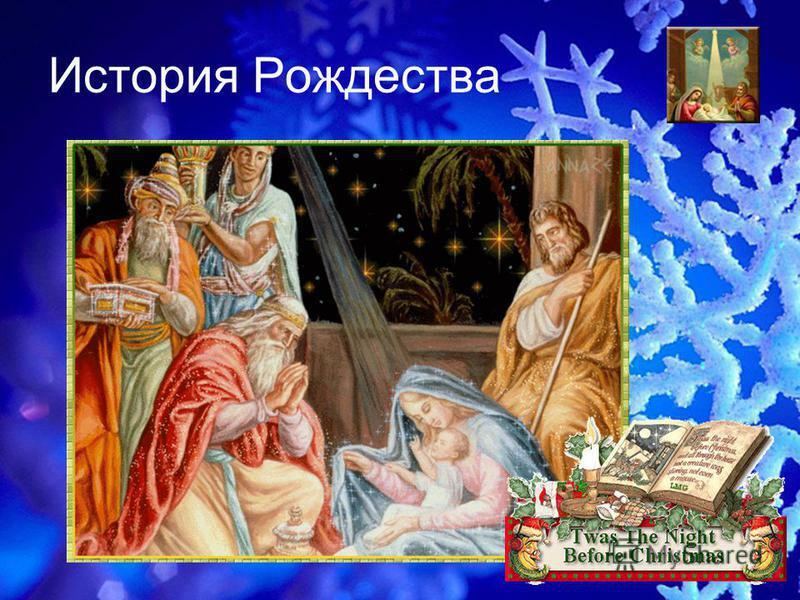 Our Topic: The main question: It is celebrated on the 25 th of December. 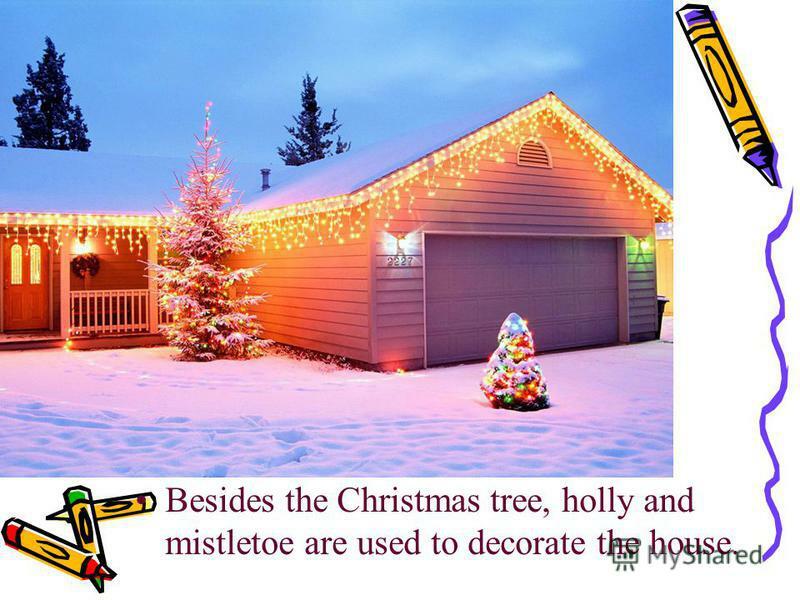 It is celebrated on the 25 th of December.. It is the greatest holiday in Britain. The 25 th of December is Christmas Day. Christmas is a religious holiday because it is the day that Christians celebrate the birth of Jesus Christ. Презентация к уроку по теме: Презентация на английском языке "Рождество в Англии"